Why should you buy a condo in Pattaya’s Centara Grand Residence condominium complex? Because you desire and deserve the best. And because you can. You want nothing but the best. You want every aspect of your residence to be the best it can. You want the bedroom to be perfectly appointed. You want the living room to be the ultimate in relaxation and luxury. You want the bathroom to be your private spa. You want the view to stretch into an infinity of beauty. You want it all. Centara delivers. Even the most cursory glance at the specifications of “Simply the most exclusive condominium ever to be built in Pattaya,” confirms that Centara is the benchmark against which all other developments will be measured. From the imported Italian marble to the included wine cooler to the unobstructed sea view that every unit boasts, Centara is the Pattaya condominium perfected. The fully furnished indoor living areas are so comfortable you could hardly be blamed for neglecting the 4 by 2.5 m, sunbed-ready balcony. And, while it is what is inside that counts, judging this particular book by its cover would not keep any critic from cracking the binding. Whether you’re approaching the glowing towers, walking through the halls or enjoying any of the multitude of functional luxury facilities, every aspect of the Centara Grand Residence succeeds in captivating your eye and refreshing your sense of joie de vivre. 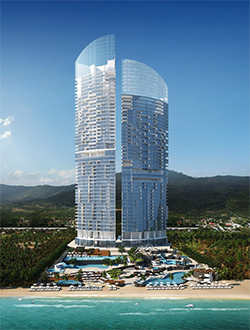 Rising from beautiful Jomtien beach like a towering jewel pulled from the sea, this new standard for luxury construction is as stunning from the outside as the sea view is from any of its multitude green spaces or its 19th and 23rd floor infinity edge pools. Truly, the Centara Grand has it all. Seven swimming pools, 150 meters of beach area, spas, gyms, a full fitness center, and of course sauna. A kids club, water park, a beach pavilion – if you want it, you will find you don’t even need to ask. Centara Grand has already provided. For those looking to enjoy not only a truly five star experience but also a sound investment opportunity, look no further. 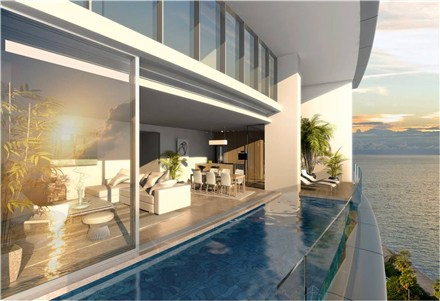 Centara Grand is one of several exclusive condominium and hotel projects being developed by Pattaya’s Tulip Group. The Tulip Group is known for associating with only the best in the design and construction fields. Their cutting-edge, aggressively marketed developments are closely watched and expected only to grow in value and become even more desirable as simply the best and most desired residences in Pattaya’s booming real estate sector. What do you get the man who has it all? The answer is, you show them how much more there is. For the person that deserves the best, there is no other choice. Whether considering a simple yet perfectly furnished studio apartment, a sensible but stylish 1 bedroom or a fully loaded, incredibly appointed two bedroom with a full kitchen and bathroom fit for an emperor the first and only option for a five star experience is the Centara Grand.